As Hurricane Irma approached Florida, traders looked for possible gains. One market that seemed attractive was orange juice. If the hurricane damaged the orange groves, it’s logical that traders who bought orange juice futures ahead of the storm could make a lot of money. So the smart money in the futures market placed their bets, as shown in the chart below. As you see, the smart money was selling orange juice instead of buying. They were selling to individual investors who relied on the news for trading ideas. This is a chart of orange juice futures with the Commitment of Traders data at the bottom of the chart. Every week, futures traders report their positions to government regulators. The raw data is difficult to read. Instead of using the government’s numbers, this chart converts the data to an index. The green line in the chart is the position of commercial traders in the orange juice market. These are producers and consumers, like Coca-Cola, which makes Minute Maid orange juice. This is the smart money. The blue line represents small traders, the ones who tend to be on the wrong side of the market most often. The black dashed line shows hedge funds. They trade alongside small traders most of the time. The lines show how bullish each group is. A rising line shows buying. A falling line is bearish. The vertical line marks Hurricane Irma’s landfall. While the hurricane approached, the smart money was selling. Individual investors were buying. They read the news. They base trading decisions on what they read. Remember, reporters obtain the news from the producers and industrial users of a commodity. The news tells us what the smart money wants us to know. This chart shows that the smart money knows what’s happening. They are betting correctly with their money. We should ignore what they say, and watch what they do. We saw this pattern before. 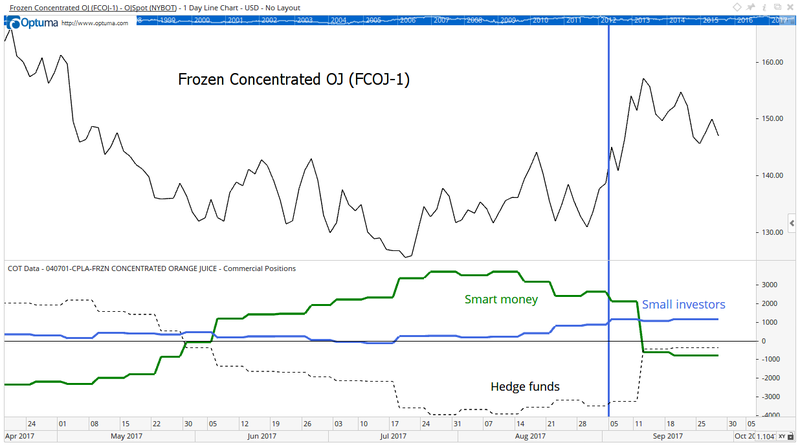 In July, I highlighted how the smart money was buying oil. Buying one contract of oil futures then would have resulted in a profit of more than $5,200. These charts tell us we shouldn’t try to interpret the news. We should follow the money. Right now, orange growers are assessing the damage from Irma. It’s severe. But oranges also grow in Brazil. The smart money knew that. They’ll always be one step ahead of the individual investor.